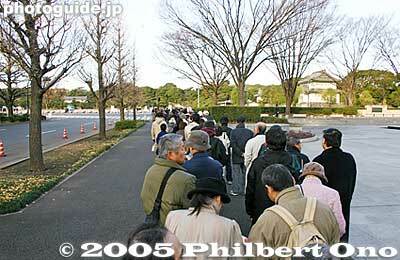 Dec. 23, 2004 at 8:30 am: Across the street from the Imperial Palace. Dec. 23 and Jan. 2 are the only two days when the general public is allowed to enter the palace to greet the Emperor and his family. A visit to the Imperial Palace by the general public is called "ippan sanga" in Japanese （一般参賀）.